See scan - perfect condition. This is a nice and rare North Korean 1960s pilot aviation wings pin / badge made out of aluminium. Such badges / pins are extremely rare to find specially from this communist / socialist country. Size is about 1" by 1.5". 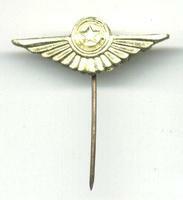 Nice and rare militaria / military collector piece and one of the nice North Korean badges.